So yesterday was the big day, my first 5K!!! As stated many times before, it was never about the time it took me to complete it, it was always about just completing the race. I did that, and a little more! The great thing is that the race was just the beginning of my Great Day! After running I got to spend the rest of my day with a high school friend as we went to a Greek festival, and the theater to see Shrek the Musical! All right I'll start at the beginning. So I woke up far to early in the morning, 6am, so that I could get on the road and to the race in plenty of time to find the location, park, check-in, and still have a few minutes befor the race began to stretch out and take a few deeps breathes. The race took place about an hour away from my parents house so since we had to be there by 8am to check-in, that meant I got up at 6am! I don't think I've been up that early since high school. Both of my parents came to be my cheering section, which was awesome not just to have people there to cheer me on, but to have people there to help me document the event. When I got there though I was a little bit surprised at what I found, this was going to be a trail run. This meant that the rain that had happened through the night was going to be a factor, when I had thought that it wasn't going to be. The course was rough, basically a mowed path through a field so there were a lot of holes to avoid, steep hills, and LOTS of mud! When I began the race I was jogging and just thinking about keeping my own pace and not worrying about what the other people around me were doing, but about a quarter mile in my plan of attack changed. I was slipping on muddy hills, and hitting holes, I knew that I needed to slow down. Although I wanted to keep pace as I had practiced, I also knew that I couldn't risk injury. So I began walking. Although I jogged for a few short distances, I mostly walked at a brisk pace. I even chicked a guy! This is a term someone mentioned a while ago when you pass a guy who then speeds up to try and prevent you from passing. Well I passed several guys who did this, and each time it made me smile. The hardest part of the race was not just realizing that I couldn't jog the course as I had hoped, but that I didn't have anybody doing the race with me. Being by myself gave me a lot of time to think about quitting. I'm not going to lie, I seriously considered it twice. The first time was just after I stopped jogging, thinking about the risk of injury and the fear of injuring my knee again. The second time I considered quitting I didn't think I would be able to complete the course because I was so tired. Both times I talked myself out of quitting. I have come too far to not finish something that I started. Although that little voice was telling me to stop I realized that was the old me, the new me, and the louder voice, kept saying you can do this, and you know you want this! When I crossed the finish line ten minutes after what I had hoped I wasn't disappointed, because I had finished my first 5K in less than ideal conditions. It's amazing the sense of accomplishment I had when that happened. My unofficial time is somewhere in the range of 54 minutes and 30 seconds, to be honest I didn't look, and my dad got the picture after I had already crossed. I am proud of that time, the fact that I crossed the finish line, and the fact that this is the first of many more races to come! All ready for the race to begin! Pushing to the finish line! Just after I crossed the finish!! After the race I went back to my parents house, took a much needed shower, and headed out again to go and meet up with Stacey, a good friend of mine from high school. She had some extra tickets to a movie called the Kentucky Show, and Shrek the Musical. I'm a big musical theater dork so I was so in! The movie was interesting, it basically talked about the history of Kentucky and some of the more interesting attractions here. To be honest though had she not had free tickets I most likely wouldn't have gone, although interesting I wouldn't have paid to see it. After the show we had some time to kill, and since parking in the downtown area can be a bit of a pain sometimes we decided to walk around the waterfront. Although at the time it seemed fine, in hindsight that may have been a bad move. While walking we found a Greek festival which we later went back to, to have dessert, and we also ended up at Joe's Crab Shack for dinner. Stacey has been a good friend for a long time so we talked a lot about what's going on in our lives and just had a good time in general. I have pictures of our time together, but unfortunately I don't have a cable for my camera, and the tech deficient parents can't seem to find one either, so I'll post those later on this week when I get home, along with more race pictures. I do have two pictures I took on my phone though to share now. Before Shrek Stacey and I visited the souvenir table. I purchased my usual program and magnet, Stacey on the other hand went for the stuffed puppet of Gingy, the gingerbread man from the show. We had some great fun with him, and Stacey even held on to him throughout the show. It was the perfect way to end the night. 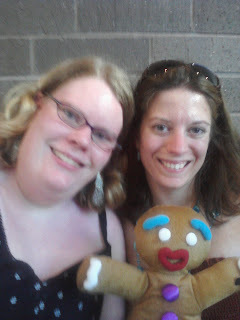 Stacey and I with Gingy before the show. 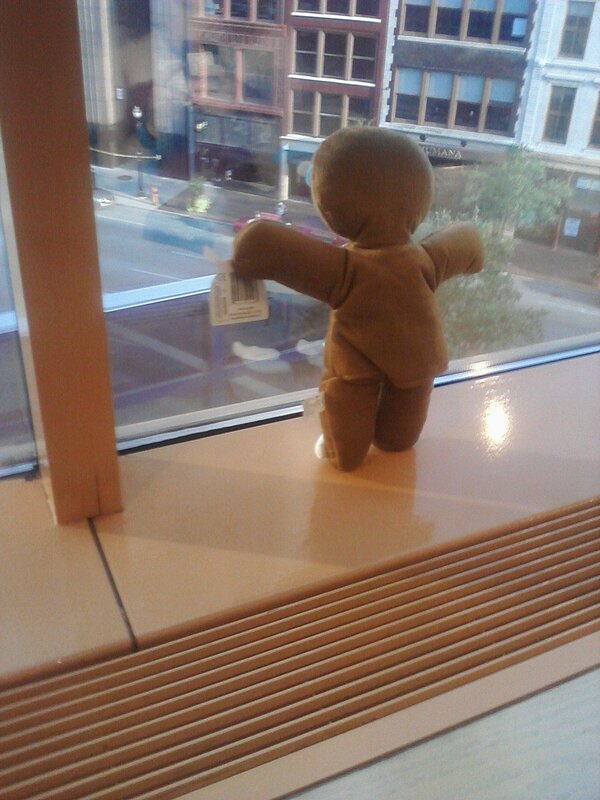 Gingy looking out over Main Street at the Kentucky Center for the Arts.